May the Martyr Saint Boniface be our advocate, O Lord, that we may firmly hold the faith he taught with his lips and sealed in his blood and confidently profess it by our deeds. Through our Lord Jesus Christ, your Son, who lives and reigns with you in the unity of the Holy Spirit, one God, for ever and ever. St. Boniface, a monk of Exeter in England, is one of the great figures of the Benedictine Order and of the monastic apostolate in the Middle Ages. Gregory II sent him to preach the Gospel in Germany. He evangelized Hesse, Saxony and Thuringia and became Archbishop of Mainz. He well earned the title of Apostle of Germany, and Catholic Germany in our own times still venerates him as its father in the faith. He was put to death by the Frisians at Dokkum in 754 during the last of his missionary journeys. The famous abbey of Fulda, where his body lies, has remained the national shrine of Catholic Germany. A Benedictine monk was chosen by divine Providence to become Germany's great apostle and patron. Boniface's first missionary endeavor proved unsuccessful (716). Before attempting a second he went to Rome and received papal authorization (718). Under the holy bishop Willibrord he converted Frisia within a period of three years. On November 30, 722, Boniface was consecrated bishop by Pope Gregory II. In 724 he turned his attention to the Hessian people, among whom he continued his missionary activity with renewed zeal. On an eminence near the village of Geismar on the Eder, he felled a giant oak that the people honored as the national sanctuary of the god Thor. Boniface used the wood to build a chapel in honor of St. Peter. This courageous act assured the eventual triumph of the Gospel in Germany. The resident clergy and the priests dwelling at the court, whose unworthy lives needed censure, were constantly creating difficulties. Nevertheless Boniface continued to labor quietly, discreetly. He prayed unceasingly, put his trust in God alone, recommended his work to the prayers of his spiritual brothers and sisters in England. And God did not abandon him. Conversions were amazingly numerous. In 732 Gregory III sent him the pallium, the insignia of the archiepiscopal dignity. Boniface now devoted his time and talent to the ecclesiastical organization of the Church in Germany. He installed worthy bishops, set diocesan boundaries, promoted the spiritual life of the clergy and laity, held national synods (between 742 and 747), and in 744 founded the monastery of Fulda, which became a center of religious life in central Germany. In 745 he chose Mayence for his archiepiscopal see, and affiliated to it thirteen suffragan dioceses. This completed the ecclesiastical organization of Germany. The final years of his busy life were spent, as were his earlier ones, in missionary activity. Word came to him in 754 that a part of Frisia had lapsed from the faith. He took leave of his priests and, sensing the approach of death, carried along a shroud. He was 74 years of age when with youthful enthusiasm he began the work of restoration, a mission he was not to complete. A band of semi-barbarous pagans overpowered and put him to death when he was about to administer confirmation to a group of neophytes at Dockum. Patron: Brewers; Tailors; Germany; Prussia. Symbols: Axe; book; raven; scourge; sword; sword piercing heart; Bible transfixed by sword; fallen oak; book and pen; club; fox; axe and fallen oak of Thor. One tradition about Saint Boniface says that he used the customs of the locals to help convert them. There was a game in which they threw sticks called kegels at smaller sticks called heides. Boniface bought religion to the game, having the heides represent demons, and knocking them down showing purity of spirit. You might use your ingenuity to imitate this game for your children and tell them the story of St. Boniface. When reading more about St. Boniface, you will discover that his baptized name was Winfrid. He took the name Boniface either when he took religious profession as a Benedictine, or when Pope Gregory II consecrated him as a regional bishop. More details can be found at Catholic Encyclopedia's entry. 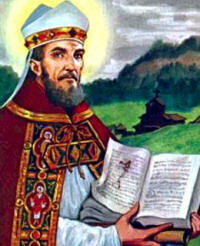 St. Boniface was the uncle of St. Walburga. St. Boniface worked with many other canonized saints in his evangelization of Germany. Find out which saints these were. Read some of the letters of St. Boniface from The English Correspondence of Saint Boniface: Being for the Most Part Letters Exchanged Between the Apostle of the Germans and His English Friends. Also, you can look at it on microform The English correspondence of Saint Boniface: being for the most part letters exchanged between the apostle of the Germans and his English friends or buy a copy at Amazon. St. Boniface, although an Englishman, planted the seeds of the Catholic Faith in Germany (at that time "Germany" included the domains of the Frankish monarchs, present-day Belgium and the Netherlands), and now Germany calls St. Boniface her patron. Bake some special German cookies or treat and learn some of the religious customs that come from this country.